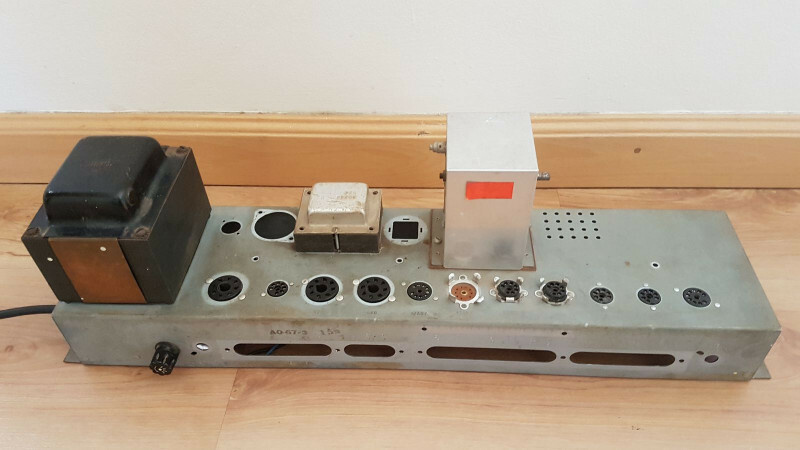 I’m starting out on my first valve amplifier build and thought I’d keep a running project log here to share my joys and (inevitable) frustrations. I started on the idea of building my own amp about a month ago when I realized that it would be easier to sneak a valve amp past the minister of finance as a project than as a purchase. 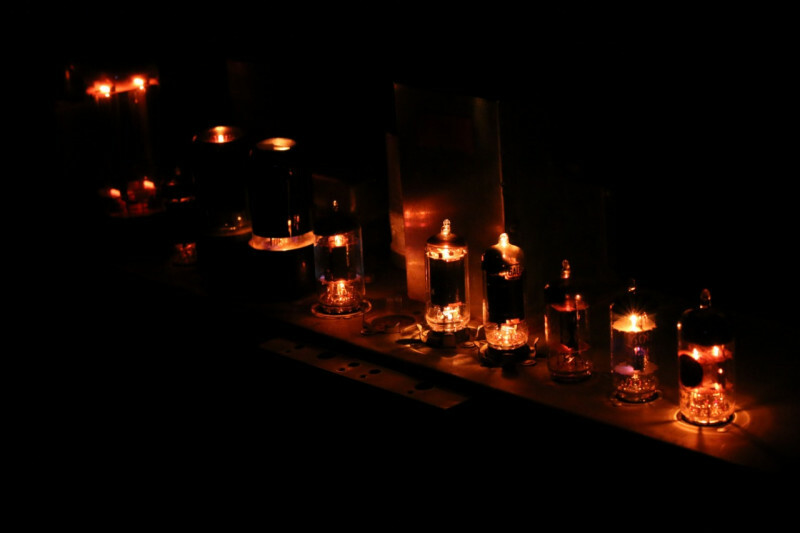 My initial plan was to start out small and build a simple, single ended 6V6 power amp, which I would initially drive off a Black Star tube pre-amp pedal that I have lying around. If I didn’t enjoy it, I’d leave it at that and my losses would be small. If the bug bit on the other hand I’d have a nice little platform that I could work off and I could then put together a number of little pre-amps and play around a bit. I was even toying with the idea of putting together some kind of power plug on the power amp so that the pre-amps wouldn’t require any transformers. I still think this is a pretty cool idea and may come back to it some time. 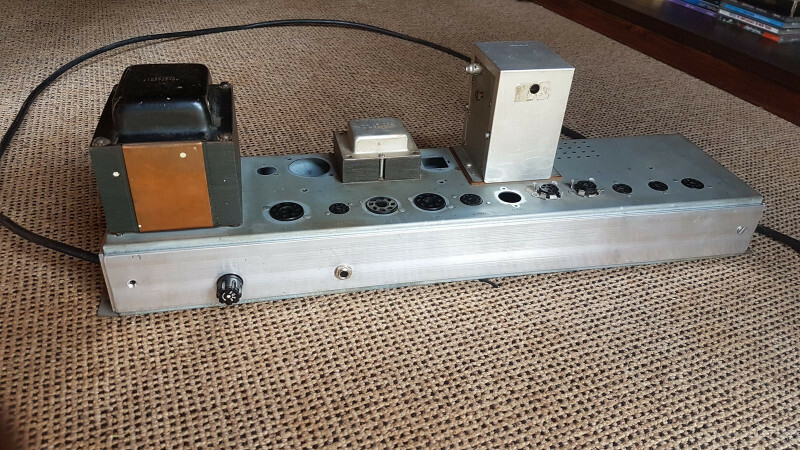 Anyway, while trying to source transformers for this build I came across an old Hammond AO-44 on Facebook (a reverb amplifier from a 50s/60s organ), which would give me the transformers and chassis I need… well, one thing led to another and I was upsold to an OA-29, which was the main amp from the organ. 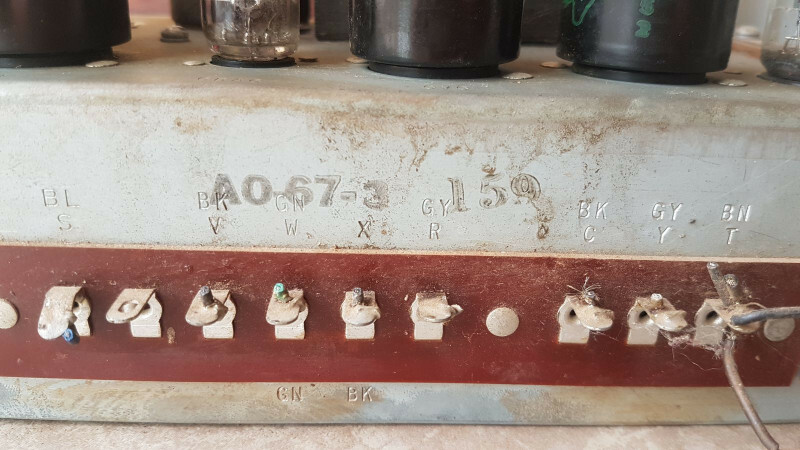 It has a beefy power transformer (I believe around 320-0-320V @ 100mA, 5V @ 3A, 6.3V @ 4A), a 20W output transformer used for push pull 6V6s in the original, a sizable chassis and a number or existing tube sockets. I haven’t received the old amp yet, but I believe that it is still in working order. I’ll probably fire it up and poke around in it before I get started but I don’t think that I’ll ultimately use many of the existing components. So, the question then is… what to build in its place? A lot of people seem to turn them into plexis but I’m after Fender tones at the moment so was naturally excited when I found this. It’s basically a Bandmaster pre-amp with a push/pull 6V6 power section and a switchable extra gain stage called the ‘trainwreck’ mod. I emailed the guy asking for some more information and he directed me to a forum where he covered his whole build. 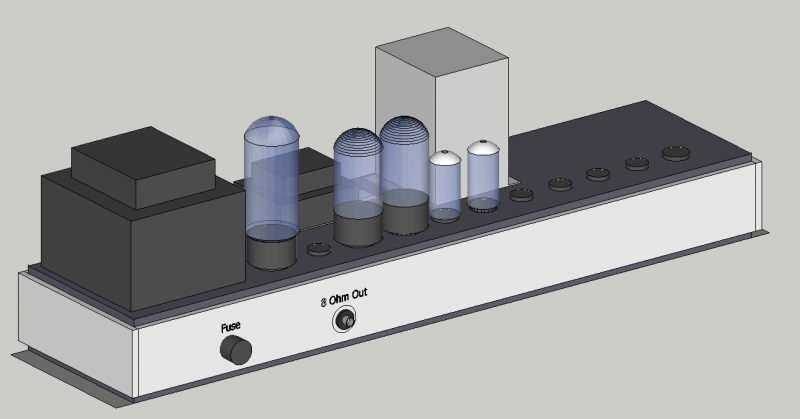 So right now, I’m looking at using the this schematic and layout as the basis my amp, possibly making with a few mods. 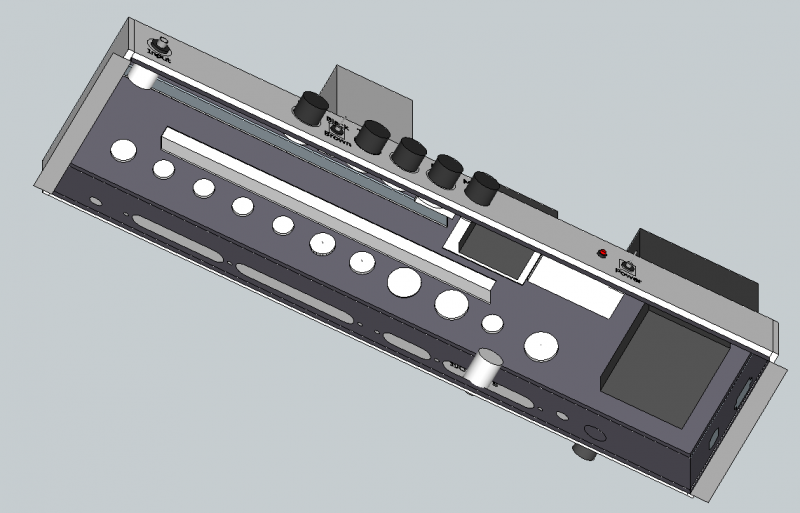 There is plenty of extra space in the chassis, so I’ve got a bit of room to play around in the future and possibly do crazy things like adding a reverb tank… hmmm, scope creep much? Anyway, I think that’s enough of a wall of text for a pictureless first post. I should be picking up the amp on Saturday and will post some photos once I’ve got it in my grubby little hands. 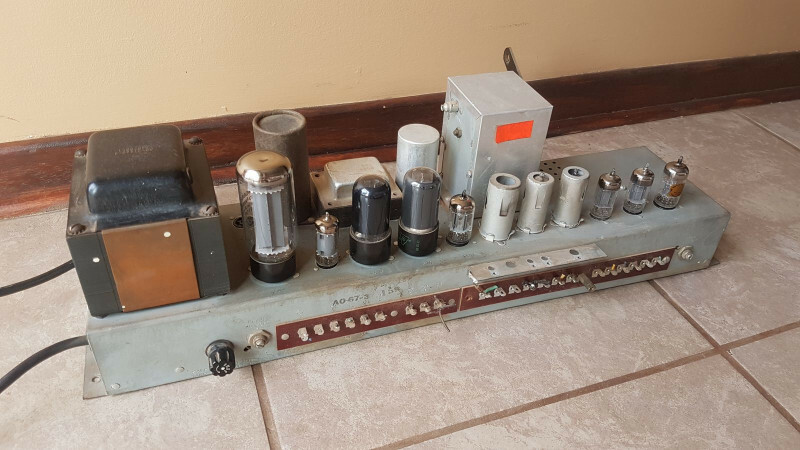 I do have some electronics experience but have never worked with tubes before, so if anyone has any suggestions or comments, I’d be extremely happy to hear them. Oooh hot diggy... this is gonna be good. Thanks for the advice! I'm definitely going to look for some safety guidance before I start up properly. I have a background in electrical engineering but have never worked with high voltage DC before. I know enough to be... shall we say cautious though! Look forward to the details. It’s a slightly different model to what I thought I was getting but close enough for my purposes. It’s actually an AO-67 rather than an AO-29… I haven’t quite figured out what the differences are yet but as I’m not planning on using it as it is I don’t think it’s too important. … and a whole bunch of 50 year old capacitors and resistors of indeterminate state. 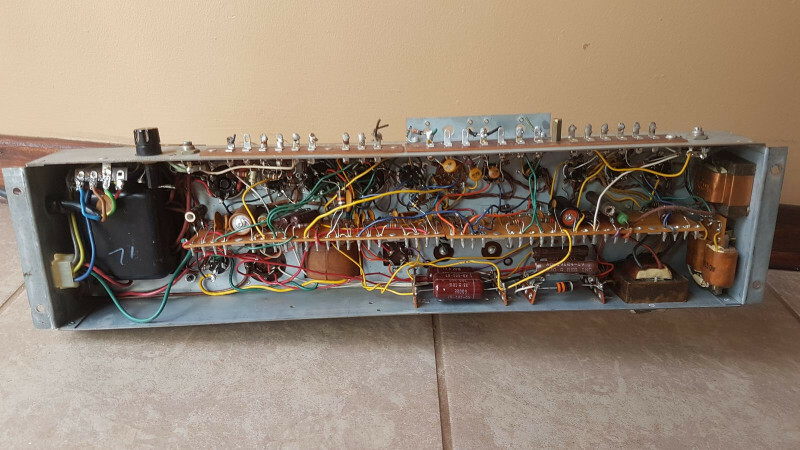 Well, without the 12AX7 there isn’t much point in trying to get it working before disassembly but I may take the tubes out and fire it up once to take some voltage measurements, although I probably won’t use the tube rectifier so it’ll be pretty academic. After that I’ll probably start taking it apart. I’ll leave the transformers and tube sockets in place. I’m also hoping that I’ll be able to keep the heater wires intact… we’ll see. In the mean time I’ll be working on my intended schematic so that I can start accumulating the parts. I’ve already made some progress so I should have something to share in a few days. First things first though… I’ve got to organize a work area! I think this project may take me a little while and the wife won’t be impressed if I leave it squatting on the kitchen table. I threw away some similar-looking capacitors today, as they must be about 60 years old, and not worth keeping. Unless one wants to build a "display" artwork. I kept the choke, looks like the one in the picture. Too bad that stash of junk did not have any transformers. The pre-amp is one channel of a pretty standard dual-triode blackface circuit (there are a few three triode blackfaces like the Super Reverb but I’ve opted for simplicity). It then goes through a long tail inverter into a push/pull 6V6 power circuit. I’m opting for a fixed bias using the RobRob (more on him later) design for pulling a low negative voltage from your main HV secondary. The power supply has been roughed out but not fully designed, I’ll give it a proper look once I have measured operating voltages on the power transformer. I intend to use a diode rectifier though, even though I have the rectifier tube available. Needs no introduction. Inserted after the first preamp stage, tone stack and volume control. The send can also be used as a line out. A switch that takes the tone stack out of circuit, giving you the raw, unshaped guitar tone. It is also supposed to give a gain boost as you aren’t bleeding to ground through the tone stack. 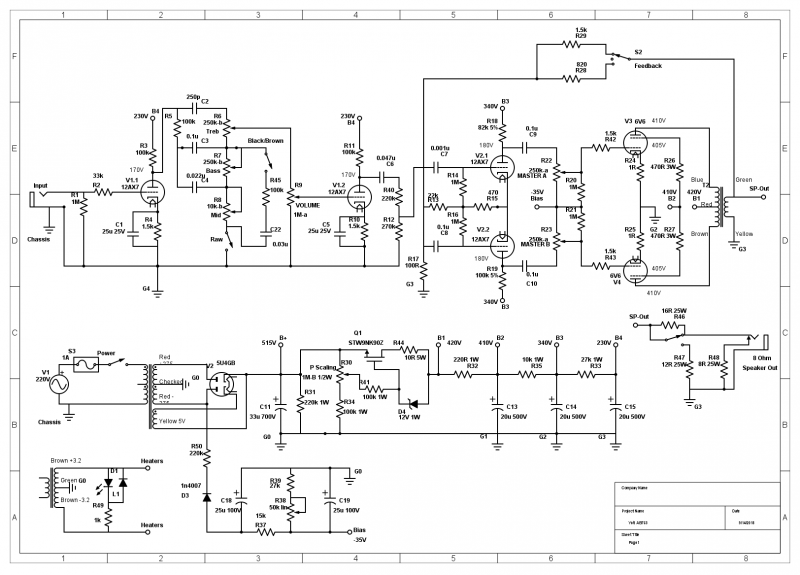 Add a three-way switch and an alternative resistor to the power amp feedback circuit. This is supposed to give you three distinct flavours in the power section. Normal feedback will be fender like (of course), feedback off will be wild and wooly and Heavy feedback will give you cleaner cleans and tighter overdrive. I’m looking at the design that replaces the power amp bias resistors with a ganged pot. This will act as a pair of resistor dividers for the input signal and as far as I can tell will only affect your bias voltage slightly due to the low current. This is supposed to be the most transparent master volume control but I’m still not 100% comfortable with it yet so I want to read up on it in greater detail. A pot with a series cap bleeding between the inverter outputs, allowing the higher frequencies from the two to cancel each other out. This is supposed to allow you to cut the ‘icepick’ highs without affecting the harmonic content of your overdrive too much. I am aware that all of these mods pull the amp away from the simple first build it was intended to be but as each only requires one or two components I’m happy to give them a try and slowly crank up the complexity. There are a few other mods that I’m considering but I’ll probably leave out of the first iteration, they can always be added later. This is my first attempt at putting together something like this and, while I’m fairly confident in what I’ve got, I’d really appreciate any input or feedback that anyone may have, particularly from those who have done similar things before. Just a quick (and potentially not very interesting ) update today. I’ve cleared a bit of space and setup a decent sized work table. I’ve also had a scratch through my father’s (enormous) stash of components. His projects were typically op-amp based low voltage circuits so aside from a few resistors, switches and wires there isn’t much I can use. I did manage to find his signal generator and oscilloscope though, which should help a lot for testing. Finally, I got my hands on a 150W incandescent bulb for a test current limiter. It’s a little smaller than I’d prefer but I think I can use it for the initial startup, even if it isn’t good for setting bias... maybe I should try to find a second and wire them in parallel. So yeah, looks like I’m ready to get going on the actual work… just as soon as I have a bit of time. This is more or less the plan from here. - Fire up the old amp and take some voltage measurements to see if I can learn anything about the power transformer. 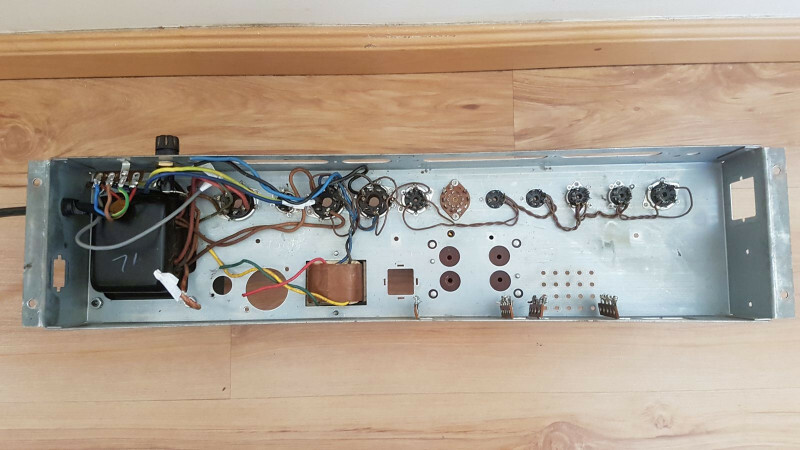 - Start breaking down the old amp… looks like everything is riveted in place so this may be a long process. - Start the actual build! Rob Rob's site is gold. There is one thing he mentions, a treble removing cap over the feedback resistor, which might be handy for the single coil fans with sensitive ears. So many things to play with! modulator thanks for the tip, I'll check it out. I was hoping to use the tone cut to tame the ice pick but if its a simple as a cap I may look at that too. Fired up the AO66 to take a few measurements and decided to take some photos while it's out. Last hurrah in its current configuration. Next time it gets power it will have a lot fewer tubes! 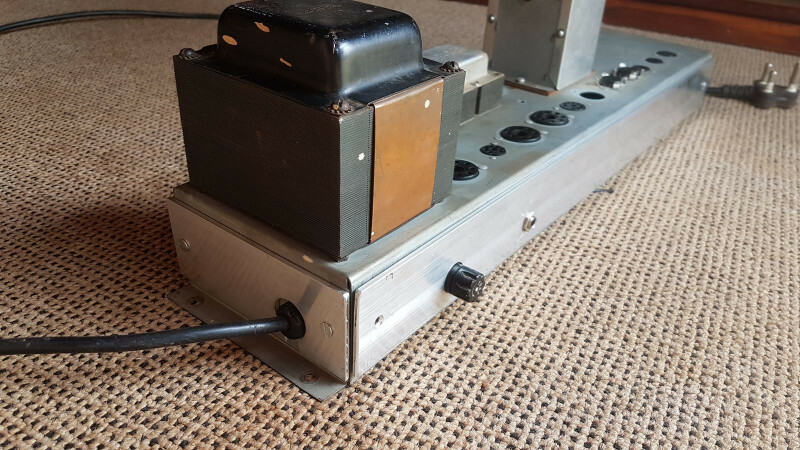 I’ve also left the expression pedal housing (silver box on the top) because it’s the same height as the power transformer and allows the amp to stand nicely on its head. I may even leave it there to protect the tubes until I build a proper cabinet for the amp. Back to the voltage. It looks like the secondary of this transformer is +-375V, which is quite a lot higher than the +-335V on the schematic. This, coupled with the fact that it was originally meant to run through a tube rectifier and I’m intending to use diodes, means that my B+ is going to be high… up around 490VDC. Even putting this through a stoutish resistor will put it at the upper end of what the 6V6S can handle. Dropping the voltage could be as simple as putting an extra filter stage ahead of the power tubes but I might also look at just using the tube rectifier since I have it and it’s already wired. Changing the power tubes to 6L6s is very tempting, but there are a few draw backs. Firstly, I want to play this at home and I’m worried they might just be too loud (time for that l-pad) secondly, I doubt that the poor output transformer would be able to take it. It was specced for 6V6s and I doubt that they would have included enough fat to move to their bigger brothers, even if I could sort out the impedances. I’m going to toy with the options and see what I come up with. I'm hoping to finalise my design and start ordering parts in the next few days. With a little luck I might even be able to start the build proper next weekend. The pictures of those glowing tubes are so nice. Did you try to play some sound through it at all before removing everything? The "cleaned" chassis looks good. As for your high B+ possibilities, seeing as you are going to use diodes to rectify, is there a way to use a voltage regulator at all? I'm sure they do exist? I have been thinking about that route for filament supplies, in the far off future. If you look at my build, I started off with 470 V. That is now down to around 350 V, but your amp will require much fatter dropping resistors than mine. You have enough space on that chassis to include a second transformer just to lower the high voltage side of things. Might be the easiest to do, if you can find a suitable transformer. You could play with a bucking transformer on the mains supply side, and see where that takes your filament voltages. I have read online that some projects ended up with 6.9 VDC on the filaments, ouch. If you are there, lowering the mains side of things will help a lot. Your amp will be too loud. Plan a second project, micro 5F1 1 Watt "home" amp? I need to start looking for components for that. I didn't get to put any sound though unfortunately. Partly because this is only part of the organ and things like volume controls, etc. aren't on this board so I'd have to figure out how i/o ports worked, partly because I didn't get the 12AX7 tube with the amp... but mostly because I didn't know where to plug the guitar in. Thanks for the voltage suggestion, I'll take another look through your thread. My issue with such a big resistor is that it's likely to really pull down when at high volumes and I'm a little nervous of that. A buddy of mine suggested that I put in a voltage based power attenuator. This will serve the dual purpose of allowing the amp to be played at lower volumes. I haven't looked at the circuit yet but I'm sure there will be a way to set it up so that it limits the maximum voltage to something lower than B+. I love the idea of that 1Watt amp. It's actually where I started before the scope creep kicked in. Sorry for the gap between posts. There has been a little too much real life lately and I haven’t had as much time to work on this as I’d have liked. 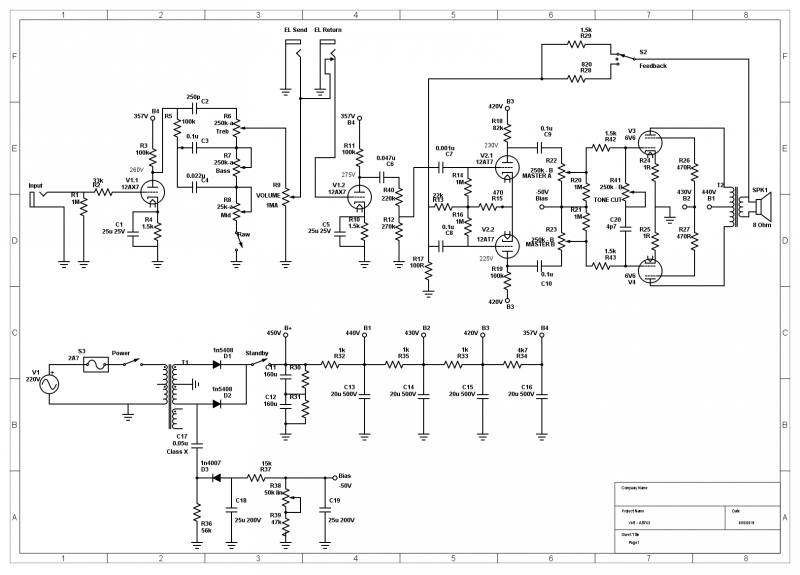 I have refined my schematic a little bit and I think it’s more or less in its final state. I’ve removed the effects loop (turns out they are a little more complex than I’d hoped) and the tone cut (got some advice that it really shouldn’t be necessary with my circuit). -	A ‘brownface’ tone stack switch, which adds an extra capacitor and resistor to simulate the 6G4-A Super-Amp circuit. 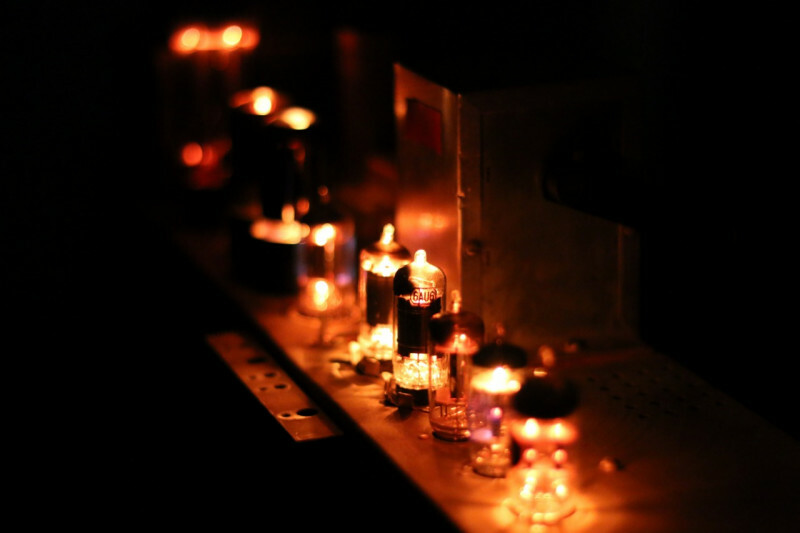 I’ve also changed to tube rectification from solid state. I already have the tube wired into the chassis and I have some voltage to shed so I thought I’d give it a try. It’s also relatively easy to change to solid state at a later stage if I need to. This is intended to be a test bed amp after all. I was given the idea of using a power scaling circuit to further reduce the B+ voltage to a manageable level. I intend to use this to drop the voltage to 420V so that I can use the power circuit from a Deluxe, which also used 6V6s. I am using a fixed bias circuit for this amp so, unfortunately, I will not get the full benefits of the power scaling. Instead I’ll have to mount the pot inside the chassis so that it can’t be fiddled with. I will be able to move it between high and low power but any change would mean re-tuning the bias voltage so that’s not exactly a quick exercise. I’m hoping to order the parts this week and with a bit of luck I’ll be able to make a start over the weekend. I’ll start with the chassis work, which will include removing the last few items that I don’t need, installing plates over the existing holes and of course drilling the holes for the new components. I’ve got a rough idea of how I’m going to lay it out, but I think that I’ll wait until I have parts in hand before I actually start cutting. The plan after that is to wire everything point to point, partly because it’s supposed to give better tone/less noise but mostly so that I can play with the layout more easily going forward. I’ll try to put together a rough sketch of my layout a little later in the week. Well, components have been ordered but it turns out I was a little optimistic on the lead times. I’ve already received the first package but I’m not likely to receive much more before the weekend. Don’t think it’ll be a problem though because I have quite a lot of chassis work to get on with, including removing the last extraneous components, cleaning it thoroughly (possibly giving it a quick sand if I feel industrious) and of course drilling the holes for the new components. I’ve put together a simple sketchup model to help plan the layout. 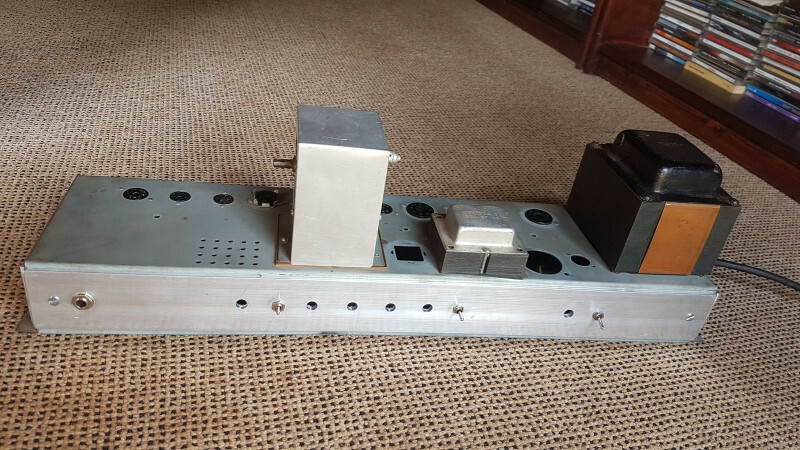 I’ve tried as far as possible to keep everything transformer side of the old expression pedal tower (big light grey box… I’m keeping it there for the moment because it’s the same height as the power TRX so you can easily turn the chassis upside down). The broad idea is to build a second channel of some flavor in the remaining space at some indeterminate point in the future. My big constraint is the output transformer as I don’t really want any controls directly next to it. The white cladding on the outside is intended to be 50mm aluminum bar that I picked up some time ago. There are holes from old components on all four sides, which need to be covered but I don’t want to lose space on the inside so I’m thinking of using it as face plate. The only downside is that it’s slightly narrower than chassis is tall so it won’t cover the full height. I’ll have a look over the weekend and see if it’ll work. I’ve also included two terminal strips on the underside that should help quite a lot with the point to point wiring. 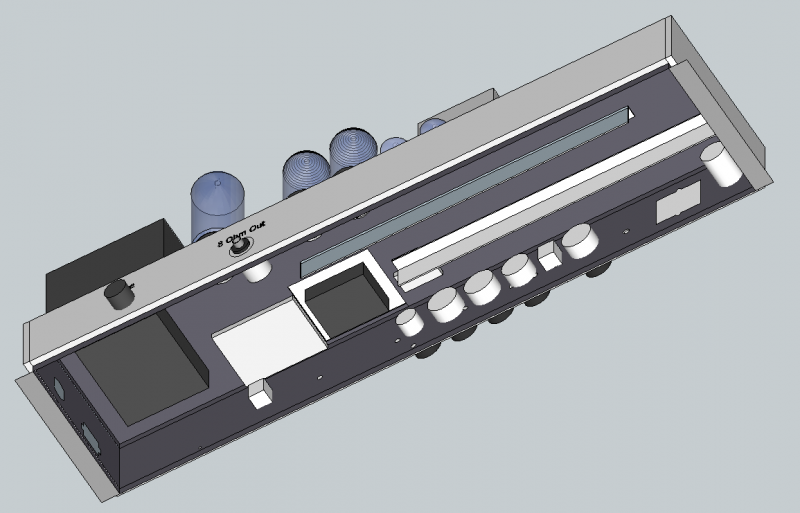 If all goes according to plan (and I don’t cut my hand off in the process) I should have a prepared chassis by the end of the weekend and I’ll be able to start on the component layout and assembly. The 'black/brown' toggle in the tone stack switches between standard blackface and a pseudo brownface tonestack with the center position being 'raw' mode. I spent a very pleasant morning yesterday working on the chassis (and then a very pleasant afternoon at Garage Days Pretoria, thanks all) and have made quite a bit of progress. 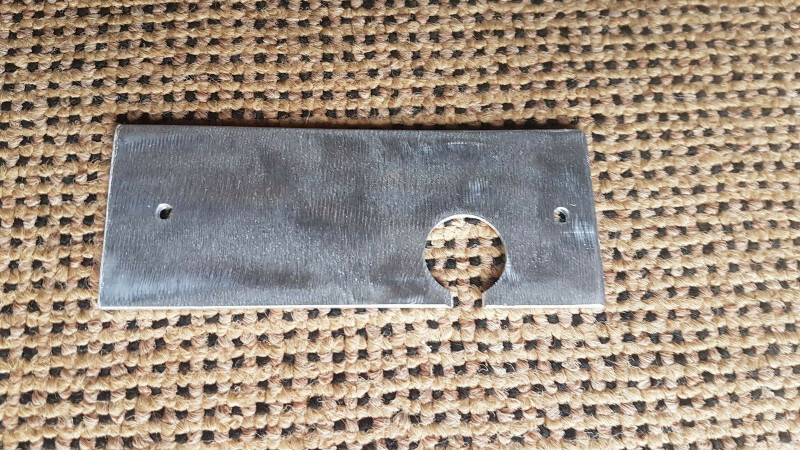 I have cut my aluminium stripping to size and cut out the various holes to mount it onto the chassis. I have also laid out the face plate and installed the output jack. I realized after the fact that I missed the attenuator/dummy load but as I don’t have the resistors yet it’s probably better if I hang fire for the moment. Another alternative would be to paint it but I quite like the aluminium. Finishing aside I still need to drill the faceplate for the actual pots, add the attenuator and mount the terminal strips I’ll be using for the point to point wiring. So I’ve gone about as far as I can go for the moment. Hopefully the components will start arriving on Tuesday and then I’ll make some real progress. It’s never been my intention to give this a professional finish but I’d like it to look neat. Looking good. For the control panel.. maybe a place that does silk screening? Or easier yet.. a place that does sign writing.. draw up the panels and ask thrm to print it on vinyl colour of your choice. Then simply stick it on. Or you could do similar on to a magnet. Qphoto does printing on magnets..
guidothepimmp Hmmmm, hadn't thought of that. I'll look into it.